Life for the Web and Media teams at the University of Sri Jayewardenepura have been nothing short of eventful! They’ve been quite the busy bees, thinking and executing creative solutions for both external and internal parties to stay on par and be better connected with the current and growing activities of Japura. Both the Web and Media teams of Japura are led by Prof. Hiran Amarasekara with the Technical Lead taken by Prof R. G. N. Meegama and Mr. Harsha Munasinghe; Information Systems Manager, Center for IT Services and the Coordinator, Media Unit. 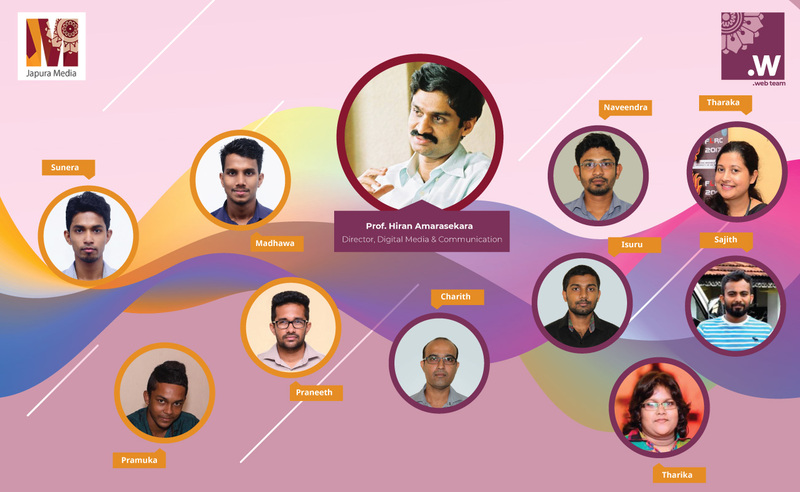 The Web team consists of a team of web designers and developers (Naveendra Sampath, Charith Saranga, Gayanath Isuru, Tharaka Ananda, Tharika Fernando, and Sajith Madusanka) together with Content creators and social media marketers (Tharaka Ananda). The Japura Media team, on the other hand, comprises of an Assistant Video producer (Tharaka Ananda) and a camera, photography and post-production team (Praneeth S. Patabendige, Madhawa Withanage, Pramuka Dulshan, and Sunera Kandamby); who assist in capturing events and producing eLearning material. Their efforts have thus come into fruition since we now have updated, all-inclusive and comprehensive websites carrying updates of the university. Their services are now provided with absolutely NO CHARGE for all Faculties, Departments, Centers, staff, and students at the University of Jayewardenepura! Contact Naveendra on 071 770 1402, 0112881892 (Intercom – 1892) or web@sjp.ac.lk for further info!